Dice. 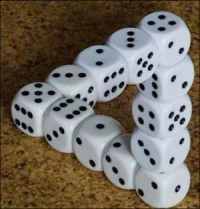 Try to arrange dice like this.. Wallpaper and background images in the अकल्पनीय club tagged: photography image illusion optical cool. yes! I love that kind of pictures!